My girlfriend was approached by one of the Great Eastern (GE) agents at an MRT station. She was recommended the Annual Cashback Endowment (ACE) Plan and her initial thoughts was it sounded good as there were cash back and the investor will get more than the premiums he or she paid. She asked me if it was a worthwhile plan and I shall share with you what I explained to her in this post. Let’s assume the best case scenario which all the cashback are reinvested and allowed to compound till the end of 18 years. The returns from ACE plan was not able to beat the returns from STI ETF. Of course, some will say it is an unfair comparison because the premiums for ACE are mainly invested in bonds while STI ETF has equity returns. I do not think this is a concern because if I am an investor, I will want to put my money where I can get the best returns based on my risk tolerance. If I can take equity drawdowns, I will want equity returns. GE used an example of a male, non-smoker, age 30 next birthday, with basic sum assured S$30,000 in the calculation. 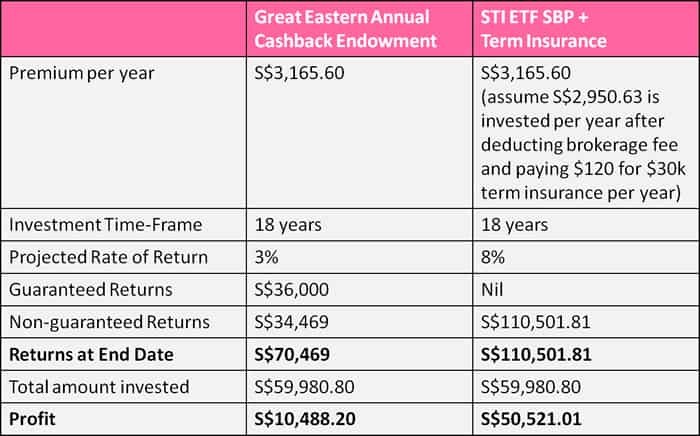 I have offered a side-by-side comparison with STI ETF SBP + Term insurance in the table below. I could get a return four times that of ACE’s with STI SBP. In addition, I used part of the money to pay for a term insurance. Considering 18 years, it is a long enough period for the STI ETF’s return to be close to the average of 8-9%. In fact, I would rather pay more for a higher coverage with a term insurance and invest the rest in STI ETF. I will be better protected and come out richer after 18 years. All is not lost for such endowment plans. As I mentioned in the earlier paragraphs, only invest in STI ETF if you can take the gyration in the stock market. If you are not able to stand firm and sell during a market crash, you will lose money. The ACE Plan has an advantage in this aspect as your money should be growing every year albeit slowly. This eases your psychology tremendously. Again, it depends on your risk tolerance and I cannot stress that enough. This is indeed a BAD deal. Just looking at the numbers, the total premium is $56980, and the guaranteed return is only $36000. This would mean that there is a potential chance that I will not get back what I put in! I will definitely NOT put my money with them. Still for me, though I currently investing on my own in local stock market, I still place some of my money in 2 endowments. One for my kids’ future education (if they are going University), another for my retirement basic needs. The reason why I am buying endowment instead of investing for these 2 purposes is that I do not wish to start drawing down on the investments if it happen to be another 1997, 2002 or 2008. The guarantee return of the endowments which I had paid for is higher than the total premium which I paying. So at worst case, I just treat them as forced savings in the bank. Hi serene, I am not an insurance agent. Hi. I know of some great endowment plans currently designed for kid’s education funding. The Cashback endowments products are not great saving instruments for many people. The fact that it allows liquidity in the bi-yearly withdrawal of coupons, it reduces the overall yield of the plan upon maturity. If flexibility and liquidity is your piorities other than returns, then go for it. To me, to buy a endowment means keeping the money until the maturity which means getting most out of it. Thanks for your unbiased write up. I recently bought an annual cashback endowment plan from GE which has a very low guaranteed maturity value. total premiums paid after 25 years is $75000. Guaranteed surrender value by then will be 7879 and non guaranteed at 3.25% is 32526. However, if I reinvest the $1575 cashback every year at around a modest1.5% (standard GE ) it will add up to another $43549. They call this the survival benefit. Is this portion guaranteed as well? I feel abit worried because only after a few months I realised the guaranteed section is so low! How likely is it that this $75000 that I put in over 25 years will at least get me a decent amount like $80 000 back? Is it worth it to carry on with the plan? I have only paid for this policy for one year so far. Terminating the contract is definitely a very big decision and it is likely that the policy will not return you any money since it is less than 2 years in force. I think there are questions you can ask yourself to help you decide. Is there an alternative option to park your money if you do not go with this endowment plan? If there is, is the risk higher than what you can accept? Lastly, I think it helps to speak to a financial advisor you can trust. Comparing Endowment and Term and Invest is not a fair comparison and I acknowledge you have already pointed out in your conclusion in this article. If I may elaborate, the endowment provides you a guaranteed maturity value (though it is usually less than the principal premiums paid) despite of the performance of the market. 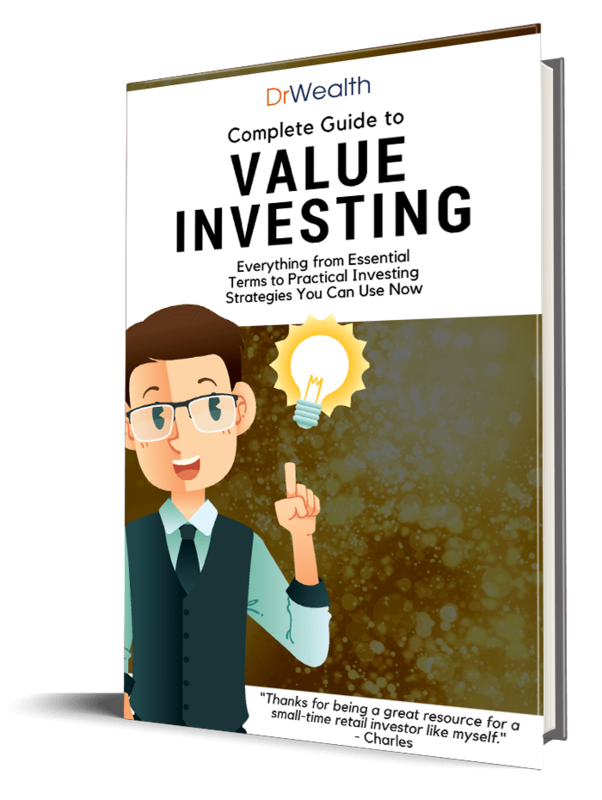 Whilst if you were to invest into the SPDR STI ETF for example, you do not have any capital protection. Also, Great Eastern endowment plans generally insure only about 105% of your premiums paid and does not insure a lump sum assured. These endowment plans allows you to insure your capital invested while providing you a long term savings option with low but steady, low risk returns. I think that you should consider apart from spending on insurance, how much of your access income/wealth do you wish to allocate to the different wealth accumulation options? Why not enjoy the best of both worlds, or best of many worlds, if we start including other Unit Trusts/ETFs with exposure types by industry/economy and ILPs which gives you the flexibility to control your insurance and wealth accumulation throughout your life. Financial planning is indeed not a simple subject, and you should consult a good Financial Consultant that can take care of your protection needs and also help you implement simple yet smart wealth allocation strategies based on your preference/needs. Anyway cheers on shedding light on this topic. Many consumers who are not financially savvy may over commit to one option without considering other options and how to mix them to suit ones needs/preference.